The founder of Himalayan R.S.T expedition, Sharada Dhakal have been working in the adventure and expedition field in Nepal from more than two decades. 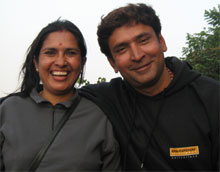 Most of its client has describes her as 'The most experienced travel consultant in Nepal'. Along with experienced leader, it is comprised of a team of experienced professionals who are trained to look after your entire travel and trekking needs and to operate a wide variety of trekking, climbing, rafting, kayaking and tours and travels throughout the remotest corners of Nepal. They will have the pleasure of guiding you on the most beautiful trails in the Himalayas, sure to enhance your holiday experience and make it a total success. Be this your first trip to Nepal, or your tenth you can count on R.S.T. team to take care of your needs from the moment you land until your departure. Himalayan R.S.T. Expeditions Pvt. Ltd.